The Northwest Pioneer Broadcasters asked me to write "A Remembrance" of my long time friend, Clay Frank Huntington. Some of the material comes from an internet book in progress of my career in broadcasting. The pioneers wanted to ask me questions so we decided to do the article in a Q & A format. We will also share some comments from another long time Clay Huntington friend, Lee Hale. 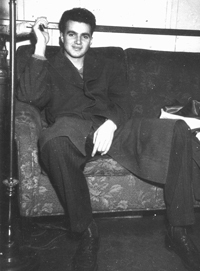 The above picture of Clay was taken by Don McCroskey in the control room of KTBI in Tacoma about 1946, in the Puget Sound Bank Building. First, I want to say that Clay was one of the nicest human beings I ever had the pleasure of knowing and working with. His smile could charm and persuade most anyone. He was a joy to work with and to know for many, many years. NBP: Do you remember when and where you first met Clay Huntington. I met Clay in 1935 when we were assigned to Roll Room 14 at Stewart Junior High. We became fast friends and got ourselves engaged in outrageous assemblies, in which Clay was emcee and I scrounged around for talent, some good, some not so good. We became editors of The Stewart Star, and when we got to Lincoln High, Clay edited the award-winning Lincoln News, and I was feature editor. Once again, we produced the school's entertainment assemblies, some often getting us in trouble for their raunchiness (very tame by today's standards). While at Lincoln, Clay became the sportscaster for local games, and I wrote a musical comedy. They called us the "Dynamo Twins." We even talked radio station KTBI into letting us produce a variety show starring our high school friends. World War II and college separated us, but we always kept in contact through the years, continually praising each other's accomplishments, Clay as the incredible Northwest icon in all things sports and I getting into show business in New York and Hollywood. I never met anyone who didn't think Clay was the most likeable person they'd ever met. He did so much, and he did it so easily and so skillfully. There'll never be another one like him. I'll miss all the phone calls, all the e-mails, all the concern he had over all of us. TR: As Lee pointed out, Clay talked KTBI into letting him do play by play sports on the 250 watt station at 1490 on the dial and a weekly variety show, while he was still in high school. After service in the military, Clay again called local sports on KTBI in about 1946. However, in the late 40s, KTBI moved from full time operation on 1490 to a new studio transmitter building at 2715 Center Street and changed frequency from 1490 to 810 with 1,000 watts. The coverage of KTBI was much improved, but because they were now on a Clear Channel, they had to sign off at local sunset to protect KGO in San Francisco. KTBI could not air local sports as games were generally played in the evening and KTBI could not stay on the air past local sunset, which could be as early as 4:15pm. So Clay's free lance services were no longer required as KTBI dropped all play by play sports broadcasts once they moved to 810. Clay opened a small advertising agency with the help and urging of Marshall Riconoshuto, (sp) who was with the Heidelberg Brewery in Tacoma. I started as a kid working at KTBI, which at the time was the Tacoma affiliate for the Liberty Broadcasting System. LBS was known for its baseball recreations by owner, Gordon McClendon. Heidelberg was a local sponsor of the LBS games. I ran the control board during the games and inserted the commercials. One day Clay walked through the control room door with a transcription on which were recorded some new Heidelberg commercials that were to be aired in the game that day. Clay was noticeably shocked at seeing such a young kid, running the control board. He sat down and we started to talk and before he left, he suggested we get together as he thought I might like to work with him in his advertising agency, Clay Huntington Advertising. Clay never ran a radio control board and knew virtually nothing about radio engineering and program production. I was rapidly learning both. So we made a great combination. Clay was a sales and promotion person, I was a production and technical person.